Helen is the UK intent holder for the international organisation Peace Across The Planet, which stands human-sized Shiva Lingam stones at key points around the planet to help people anchor their intent for peace. For the last 6 years she has been engaged in group ceremony at the time of each full moon, new moon, Equinox and Solstice, gathering people in meditation and in sound to help anchor the energetic shifts at these times of opportunity. 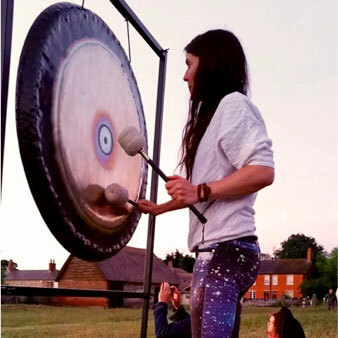 Helen ran a centre of meditation, healing and sacred sound in the centre of Avebury stone circle for three and a half years with her partner Adrian, who was the instigator of much of this cycle of group work in Avebury. Tragically Adrian left his body last year. Helen and her daughter Grace continue to live and work in the area, where Helen is using her experiences of birth and death to develop her understanding of the extra-ordinary power of sound to release emotion, to heal, to integrate, and to reach across the illusory divide between Heaven and Earth. She invites you to join her in sounding the group soul. There has never been a more important time to express the truth of who you are.